Even though the GiaMaria's listing might cause you to think only about a fun place to spend a night or a holiday, she is in reality just a piece of a unique and wonderful experience. And this becomes apparent from the moment you turn onto a wooded National Park road that parallels Civil War breastworks, beautiful homes, and a couple of well kept farms before it terminates at Fort Hoke Brady. From there you will pass through a coded gate, and as you approach Richmond Yacht Basin (Virginia's oldest marina) only a few feet away, you will see one of Richmond's best views; America's first river; the James. But before I get into telling you about what lies ahead for you to enjoy, let me tell you about Homeaway's Ranking Metrics System. I do not know exactly how long ago it was introduced, but what I am proud to say is that out of its current 691 rental properties, the GiaMaria has been rated at times as their #1 property, and never less than their #3 property. Now: for the James River and the calm old oxbow where the GiaMaria is berthed, it is an awesome place to spend your time. In fact, it is a place like no other in the entire United States, and I will make an honest attempt to back up this statement in the description that follows with the few words allowed. As for the vessel, she is a 50' Chris Craft houseboat that has been completely remodeled inside and out in order to give our guests a home-like atmosphere without losing the feel of being on an old riverboat. It is modern in every sense of the word. It has been reconstructed to have a large bathroom with a full sized vanity, a 4' designer shower, ventilator fans, and its own USCG certified sanitation system. It comes complete with a queen eleven inch memory foam mattress (Sleep Innovations) and high quality bedding, a small but complete galley and a large salon for relaxing. Outside you will find a large open upper deck with great views for morning coffee or evening drinks and a lower covered bow deck. See attached pictures. But it is not just the GiaMaria that you will enjoy. It is also her unique location.The Richmond Yacht Basin is a gated facility for members and guests only, yet there is nothing stuffy about it, and it is only 9 country road miles from downtown Richmond. It also has the distinction of being the oldest marina on the James River and its setting cannot be duplicated because it is surrounded by a beautiful island, the Richmond National Battlefield Park and a well kept privately owned farm. It is also only one mile from Osborne Landing, a county owned facility including a new fishing pier, a Bass Master's boat launch, great walking trails along the river, canoe and kayak launch ramps, pavilions for picnics/cookouts, bathrooms and wonderful playgrounds for kids, and it is always kept in tip-top shape, and yet it is all free to the public. After a beautiful canopied drive which will take you to the marina, you will find yourself standing on the ground where so many famous people lived and events took place that shaped our nation's history. Some of the historical characters who lived in the nearby Indian settlement of Arrohateck included Chief Powhatan's son, Tanx or (Parahunt) and Pocahontas his daughter, who married her English born husband John Rolfe. Pocahontas and John Rolfe after marriage made their home here as well, and with the aid of many nameless slaves, (black, Indian and white) they saved Jamestown and the first English colonists by producing a type of "Varina" tobacco that would have tremendous economic value in many European countries. It is a spot where Captain John Smith found his "sweetest water" during his explorations of the "wilderness", and in later years of sail the area surrounding those springs became a local stop- over known as "Sailor's Tavern". People like George Washington, Patrick Henry, Abraham Lincoln, Robert E. Lee' mother, Anne Hill Carter, John Marshall, Chief Justice of the Supreme Court, Susannah Bowling, Layfayette, Benedict Arnold, Gen. Cornwallis and many other great men and women passed thru this oxbow in the James River on their way to transform our nation. Battles on land and in the river were fought here too, during both the Revolutionary War and the Civil War. And during the Revolutionary War, Benedict Arnold sank the Colonial Fleet within eyesight of the GiaMaria before burning Richmond. Union Ironclads like the Monitor and Galena fought other Ironclads like the Confederate's CSS Virginia while trying to pass Drewery's Bluff, the confederate "Annapolis" in order to try and subdue Richmond, but that never happened. And Just around the river's bend east of Richmond Yacht Basin is Henricus, the London Company's second settlement after Jamestown in the New World. Unfortunately the original "cittie" was destroyed by Opechancanough, Chief Powhatan's successor "brother" during the Indian Massacre of 1622. Today however, Henricus is a thriving reconstruction of what it was like in the days of Sir Thomas Dale's early 1600's "town", and many of my guests who have visited there say it is on par with Jamestown. Just down the road heading east along Route 5 (a Virginia Bi-Way) are plantations like Shirley, still owned and operated by the same family since its beginning in 1613, Berkley, where Taps was first composed and played, and where the first Thanksgiving was arguably held, Westover, the home of President William Henry Harrison (Ole' Tippecanoe), Sherwood Forrest, the home of "His Accidency", President John Tyler. And there is also Evergreen, the birthplace of Edmund Ruffin, who is the father of modern agriculture and the southern firebrand who is credited with firing the shot that started the Civil War. These are just a few of the historical places or attractions to be found within a few minutes of the docking space of the GiaMaria. Going west on Route 5 into Richmond you will find St. John's Episcopal Church where Patrick Henry told the King of England, to go to hell, or Hollywood Cemetery where a great many historical figures are buried like the Presidents Monroe and Tyler. Within minutes if you are a Civil War buff, then you are in luck because you will be set squarely in the middle of where the Battle of the Crater took place, as did Cold Harbor, Malvern Hill, White Oak Swamp, Deep Bottom, Chaffin's Farm, Pamplin Historical Park and City Point (Gen. Grants headquarters during the siege of Petersburg) and many other well known and not so well known battle sites and fortifications. Much about our old and dusty beginnings causes us to be proud, but at the same time ashamed. However, because of the lessons learned from our past, the Richmond area today has become a bright and shiny place set like Rome on seven hills. Here you will find many and varied museums or river rapids for those brave enough to take the plunge, sports events of every kind, major universities and hospitals like Virginia Commonwealth University's Medical College of Virginia, world class car races at Richmond International Raceway and cycling (the UCI world championship 2015), as well as the Richmond Marathon (rated the 18th largest in the nation). There are also restaurants galore from local favorites to world class dining. Richmond is fast becoming a gourmets delight and the Craft Brewery Capital of the South. Chic shopping districts like Carytown, River Road, Short Pump or Stoney Point are all within a short distance, as are outlet malls and several large shopping centers. Watersports and tours of many kinds are offered in several nearby places. Major garden tours (voted one of the best in the country) like Lewis-Ginter Botanical Gardens or Maymont Park as well as national, state and local parks are all within minutes of the GiaMaria. And in one to two hours by car you can be in the Blue Ridge Mountains or Charlottesville or Virginia Beach or Washington, DC, or Williamsburg or Jamestown, or Yorktown, or Petersburg, or Kings Dominion, or Busch Gardens, and several major outlet malls. We even now enjoy the Virginia Capital Trail. It is a cycling/walking, running hard surfaced path of 52 miles that links Richmond, the Capital of Virginia, and the Colonial Capitals of Williamsburg and Jamestown. And all of this is only a sampling of what you will find within a stones throw of the GiaMaria. The area though is also a wildlife lover's delight. There are many native species of plants and animals such as rare Lady Slippers, Bald Eagles, ancient swamps of Cypress and Junipers, Running Cedar, and Song Birds galore. There are Foxes, both red and silver, and occasional bobcats, beavers and otters. We are also a flyway for many species of animals, such as Butterflies, Ducks, Geese, Humming Birds, Robins, Northern Bald Eagles. Fish such as Striped Bass, American and Hickory Shad and American Eels spawn here in the spring. And in the fall, ancient Sturgeons weighing more than 500 pounds can be seen jump out of the water. And if you like fishing, we have both Large and Small Mouth Bass, several species of Catfish, record sized Crappie and several local guides will guarantee that you will catch a catfish of 40 pounds or more during late fall and throughout the winter. And on a totally different note, if dancing is your thing, then the tobacco company is just down the road where you can party late into the night or we can hook you up with a lively Salsa or Argentine Tango group for some lessons or a Milonga. One thing is for sure concerning where the GiaMaria rest, you will not be hard pressed to fun places to suit your interest because it is all here. However, nothing in my opinion can compare with the peace and tranquility of witnessing nature from the decks of the boat. I am a retired tugboat company owner/captain who cannot get the James River out of my system, I began going on tugs with my dad when I was just four years old and that was more than 7 decades ago. Throughout those years I was blessed to meet and befriend people from many seafaring nations and from all walks of life. Sometimes I wondered how some ships ever made it across oceans to come and load cargoes. The Captain's entire family would be living aboard with chickens and goats and dogs and dried fish hanging from many places on the outer decks. At other times the officers would be in full dress and sail spotless ships into the harbor. Stories that were told to me I have tried to document in a yet to be published manuscript, (Chosen River) because they were often told from the heart of men who seldom saw their loved ones or who escaped their homeland and probable death for a better life as was the case of a wonderful skipper who told of the atrocities committed by Mao Tse-Tung after the end of WWII. During those years, I raised a family, built some homes/restaurants, earned a degree from Richard Bland College of the College of William and Mary, with continued ed at Virginia Commonwealth University and University of North Florida. In 1987, I was appointed by Governor Gerald Balliles as the Maritime Commander for Central Virginia in the Virginia State Guard with the rank of Lt Colonel. I am currently married to my beautiful wife, Ruth Christiane Rawlings, a Rocky Mountain girl turned Queen of the James who at t age of 60 received a Master of Teaching degree. Ruth has enjoyed a colorful background that spans from raising kids to skydiving as a student with the Golden Knights, to acting as the lead in many plays and musicals such as South Pacific, Zorba, Scrooge, Wait Until Dark and she also has starred in Brigadoon and Pajama Game and later she sang alto with the Richmond Symphony Chorus for seven years. Virginia has its share of famous places to visit and no one can dispute this fact. For example we all know of Monticello, Mount Vernon, Civil War sites such as Manassas/Bull Run, City Point, and the Battle of the Crater. But then there is this little known place to lay your head that virtually no one has heard about, and it is in many ways far more historical than any other of these locations because of the varied influences it has had on our country's development. And that place is the area where the GiaMaria and the Cookie B rest in Virginia's oldest marina. Consider this; on our shore and within a mile surrounding our marina Chief Powhatan ruled over the village of Arrohateck, and Pocahontas and John Rolfe's farm abutted the marina where they would grow the Varina tobacco that would save the colony from being abandoned. Captain John Smith wrote that he filled his ships with the best "sweetest" water from our spring, and Henricus became the second English settlement in America after Jamestown (open to the public as a restored "cittie"). Here Benedict Arnold would destroy our Colonial fleet of ships during the American Revolution and troops would pass by here on their way to fight in the War of 1812. Three Medals of Honor would be awarded here because of bravery during the Battle of New Market Heights/Chaffin's Farm. A major prisoner exchange took place just around the bend at Akien's farm at the end of the Civil War (my great grandfather Emmitt Brown was one of them). And sadly many slaves passed by our shores on the way upstream to Richmond where they would be sold. But thankfully those who would free them like Abraham Lincoln floated close behind. Men like Washington, Lafayette, John Marshall, Peter Jefferson (he lived here) and so many more passed within feet of our little marina. Yet we are only a stone's throw away from Richmond, Petersburg, Charlottesville Jamestown, Williamsburg, Yorktown or Fredericksburg. Va. Beach or Washington, DC 2 hours by car. It is Lipstick red with chair rail, a four foot ceramic designer shower with shampoo, conditioner and body wash furnished. It has a US Coast Guard approved electric toilet with it own sanitation system (no sewage is kept aboard the vessel). The GiaMaria's bathroom also has a large vanity, hot and cold pressurized water, lots of light, exhaust fans, night light, hair dryer outlets, heat, outside view window, and a ceramic tiled floor. You will also find ample towels, etc. in the vanity. Hadad's Beach is not only a beach but great picnic area and a venue for some musical entertainment as well. The galley is small but has all the conveniences that you would expect to find in a small condo. 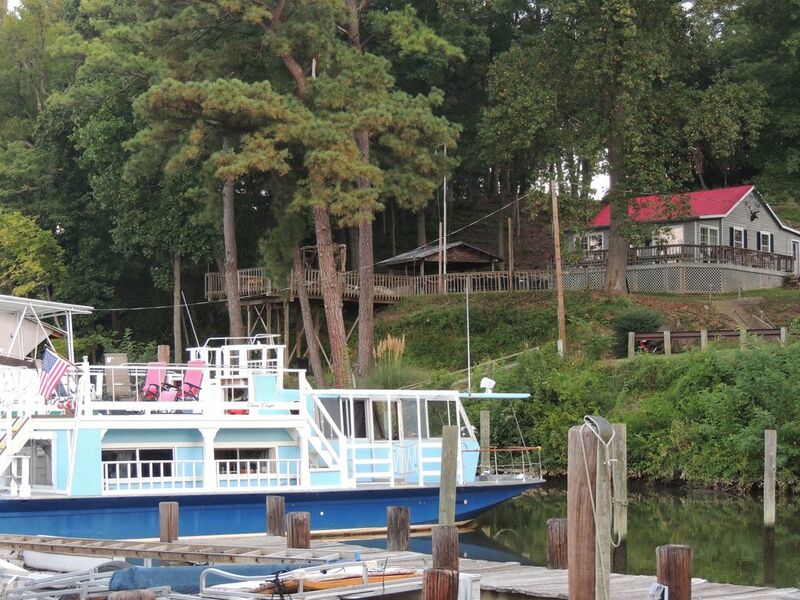 Private river tours are discounted for stay aboard guests. Canoe sailing and kayaking easily arranged as are fishing tours. This is a great place for those who want to paint, write or commune with nature. You are in the country, yet only fifteen minutes from the Governor's Mansion in Richmond, the capital of Virginia. We absolutely loved our stay! Captain Ron was delightful – made us feel right at home and spent time with us telling us about the area and it’s history. expected , were nicely decorated, had Wi-Fi and cell service and even a television! We loved the fact that coffee was there for us in the morning and we had a small kitchen with a refrigerator and microwave. This was a surprise for my husband’s birthday and he loved every minute! Thank you for such a wonderful stay and we look forward to returning and staying longer. Enjoyed our stay! The houseboat is very charming in a quiet marina. There is a lot of history in the area. Captain Blaha was a great host. Every little last detail of being at home is there for you. The Capt is flexible and accommodating!! Clean....warm and inviting. Capt. Ron is a wonderful guide listening to of his stories of the waters and characters along the way. Am anxiously awaiting book!! Headed back next weekend with our pups and cannot wait. Our love of being in, on, or near water, led us to Ron's houseboat. It was docked in a private, gated marina which led to a great sense of safety and security. The generous amount of supplies that were provided negated the over packing chore we dread so much. There wasn't one item that we wanted/needed that wasn't already available on board. We only had a few days, so we used our time mostly enjoying both the upper and lower decks and Osborne Landing. Although the boat and marina have aged gracefully since the pictures were taken we enjoyed our time there relaxing and just kicking back. This is a review that i appreciate above all others. The reason? During the month of October I offered a 25% discount to anyone who would book the GiaMaria and write an honest and unbiased review and this elderly couple agreed to do it. I am proud to say that they took my offer seriously which will help me to spruce up some areas and make even better other areas or convienciences. I would have preferred 5 stars. But i think with such a request on my part that would have been unrealistic. I feel certain that the initial strategy to locate Richmond in its present location was fairly thought out by its original founders. Being located at the last possible point on the James River where commercial vessels could conduct worldwide trade as well as collect goods from the far interior of the country, was by no means a stroke of luck. On the contrary, it must have been a stroke of genius. It is about 80 miles from the major ports of Norfolk/Portsmouth and Hampton/ Newport News or the Chesapeake Bay/Atlantic Ocean. Richmond is also strategically located about 100 miles from Washington DC or the Blue Ridge Mountains and 85 miles from Charlottesville or the North Carolina border. We are fortunate to have major highways going north and south (I-95), east and west (I-64), circling (I-295 to the east and Rt 288 to the west) and other freeways cris-crossing through Richmond. These routes are Rt 895 (Toll) just south of Richmond and the expressways are the Powhite (Toll), (east to west) and the Richmond Expressway (Toll) that runs through the middle of the city (north to south). Routes 1 and 301 (north to south). With so many major roads leading in and out of the city it is no wonder that we have such a diverse community of people, businesses, religions, educational opportunities, medical facilities, museums, sports events, nightlife and so on. Richmond has also become a hot spot for fine dining, and craft beer lovers. And there is no shortage of festivals at almost anytime of the year. Richmond is no longer a backwater town because there is something here for everyone. Note: if you want to get a feel for the James River, check out the internet video: "On Board With The Henrico Marine Patrol" June 8, 2015. As the longest living professionally licensed captain on the James River, I was honored to give opening comments, mid-video comments and closing comments about our beautiful river. Rates are subject until reservations are confirmed. Children 12 and under must wear life vest/jacket/etc. while on the docks. No smoking/vaping inside the boat!